The Chicago Bears were 3-0, with all of their wins coming on the road, as they prepared to host the Baltimore Colts on October 6, 1963. Under 68-year-old head coach and owner George Halas, “The Papa Bear”, it was apparent that the team was ready to contend with the Packers, winners of the previous three Western Conference titles. Assistant coach George Allen had installed a zone defense, and as a result the defense was the key to Chicago’s success, being strong against both the run and the pass. The conservative offense was directed by QB Bill Wade, who had All-Pro TE Mike Ditka and flanker Johnny Morris as receivers, as well as a solid stable of running backs. The Colts, under first-year Head Coach Don Shula, were 1-2 and clear underdogs coming into the game. While they still had star QB Johnny Unitas, his two best receivers, split end Raymond Berry and flanker Jimmy Orr, were both out with injuries and HB Lenny Moore was available but had been slow in recovering from an appendectomy. Defensively, both star DE Gino Marchetti and LB Bill Pellington were playing hurt. There was a standing-room crowd of 48,998 in attendance at Wrigley Field on an unseasonably hot afternoon, and they saw the defenses dominate a scoreless first half. Wade failed to complete any of his first eight passes, and his first successful throw was to FB Rick Casares for just one yard. Bob Jencks missed a 44-yard field goal attempt for the Bears. Meanwhile, Unitas was exposed to a heavy blitz and Baltimore couldn’t sustain a drive against the attacking defense. The Colts nearly scored at the end of the half, but after Unitas threw to Moore to advance to the Chicago 35, they couldn’t get a 42-yard field goal attempt by Jim Martin away in time. In the third quarter, the Colts drove to the Chicago nine and finally put points on the board when Martin booted a 16-yard field goal. With Wade still ineffective, Halas made the decision to lift him in favor of backup QB Rudy Bukich (pictured at top). The 31-year-old Bukich, a ninth-year veteran out of USC, was making his first appearance of the season. A career backup who was in his second stint with Chicago, he also had a very strong arm. 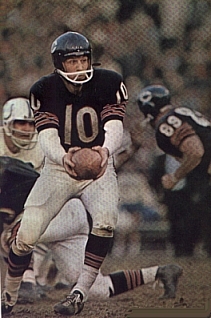 In the first series with Bukich behind center, he handed off to Casares on a draw play that gained 30 yards and then passed to Ditka, bringing the crowd to life. Two more completions to split end Bo Farrington picked up another 37 yards. Chicago drove to the Baltimore 21 but Jencks again missed a field goal attempt, this time from 28 yards. On Chicago’s next series, the offense again moved into Baltimore territory. 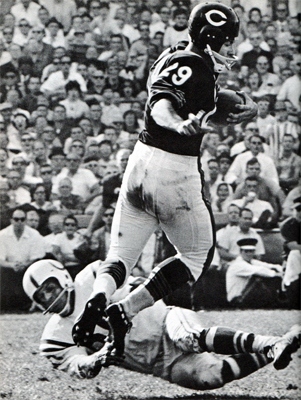 With less than ten minutes remaining in the game, Bukich threw to HB Ron Bull (pictured below) across the middle and the halfback leaped over safety Andy Nelson and had clear sailing to score a 44-yard touchdown. He was helped by an outstanding block by Ditka on Baltimore CB Bob Boyd. Five minutes later, after recovering a fumble by the Colts, Roger LeClerc capped the scoring with a 16-yard field goal. It was another fortuitous personnel shift by Coach Halas with LeClerc coming in to placekick instead of Jencks, and it was all the Bears needed as they came away with a hard-fought 10-3 win. The Bears had the edge in total yards (281 to 210) and first downs (15 to 11). Chicago had the better running total, gaining 147 yards to Baltimore’s 45 on 22 attempts. While the Bears applied constant pressure on Unitas, they sacked him twice, compared to three sacks by the Colts. Baltimore turned the ball over two times to one given up by the Bears. Bill Wade completed just 5 of 21 passes for 50 yards with one intercepted before he was relieved. Rudy Bukich was successful on 6 of 7 throws for 112 yards and the game’s lone TD. Rick Casares ran for 54 yards on 7 carries and Ron Bull added 39 yards on 13 attempts and also caught two passes for 44 yards and the TD. Bo Farrington had three pass receptions for 42 yards. For the Colts, Johnny Unitas went to the air 36 times and completed 21 for 182 yards and had one intercepted. HB Tom Matte led the club with 7 catches for 56 yards but gained just 8 rushing yards on 5 carries. FB J.W. Lockett gained a team-leading 13 yards on 10 rushing attempts. Flanker Willie Richardson, filling in for the injured Jimmy Orr, pulled in 6 passes for 53 yards. The win kept the Bears undefeated at 4-0 and a game in front of the 3-1 Green Bay Packers. It would be a close battle between the two clubs all year with Chicago winning the Western Conference with an 11-1-2 record (as opposed to Green Bay’s 11-2-1, with both losses coming against the Bears). Chicago defeated the New York Giants to win the NFL title. The Colts came in third in the Western Conference at 8-6. Rudy Bukich returned to the bench as Bill Wade quarterbacked the Bears the rest of the way through the NFL Championship game. He appeared in six contests and completed 29 of 43 passes for 369 yards with three touchdowns and two interceptions. Bukich supplanted Wade in 1964 and had his finest season in ’65 when he led the NFL in passing. But by the end of his 14-year pro career, he had returned to the backup role that he held during most of that time.